B Is For Bunny [W5069] - $12.00 : Yarn Tree, Your wholesale source for cross stitch supplies. 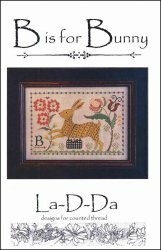 Cross Stitch pattern from La-D-Da. Look at this adorable pattern for Easter or for a child's room! The bunny is hopping away with a basket full of eggs. Flowers are blooming on each side of the bunny. A letter B is stitched in the left corner. A border is stitched around this design to complete it. Stitch count 171w x 115h.